When Natalie Boyd inherits an old cabin in the north Georgia mountains, she thinks it could be the answer to all of her problems. She’s ready to start over after a heart-breaking divorce, and the cabin on the banks of a river once mined for gold is the perfect hideaway for her new, reclusive life. No sooner does she settle in, and Natalie realizes that living in the shadow of Good Hope Mountain isn’t what she expected. Her new neighbor, Jonathan Wilby, has plans for his property as soon as winter’s over, and that means noise, traffic, and people. To make things worse, he’s drop-dead gorgeous and could charm the skin off a snake. Natalie braces herself to do battle over the land and to resist Wilby’s charms, but her healing heart, an incredible discovery, and unexpected friendships along the way bring a gold mine of change she never expected – and just in time for Valentine’s Day. This story reels you in from the beginning. Natalie and Jonathan's story is relatable. The story was sweet and I couldn't put it down! I highly recommend this book! Giveaway Details $25 Amazon Gift Card or Paypal Cash Giveaway Ends 3/12/19 Open only to those who can legally enter, receive and use an Amazon.com Gift Code or Paypal Cash. Winning Entry will be verified prior to prize being awarded. No purchase necessary. You must be 18 or older to enter or have your parent enter for you. The winner will be chosen by rafflecopter and announced here as well as emailed and will have 48 hours to respond or a new winner will be chosen. This giveaway is in no way associated with Facebook, Twitter, Rafflecopter or any other entity unless otherwise specified. The number of eligible entries received determines the odds of winning. This giveaway was organized by Kathy from Clean Wholesome Romance and sponsored by the author. VOID WHERE PROHIBITED BY LAW. My experience reading this book was varied. I was excited for the story from reading an excerpt during its promotional blog tour, but once I got into it, I discovered that overall the author's writing style isn't my cup of tea, as well as being annoyed by the main character Sophie. She seems likable enough, but also behaves in a shallow manner, at times immature, condescending, judgmental. Fortunately she improves over the course of the book, but later when she is called on her earlier behavior, she denies it, or at least never comes to a full understanding, which made me not feel sorry for the consequences she faces. I think telling part of the story from Captain Murdock's perspective might have balanced out Sophie's voice. 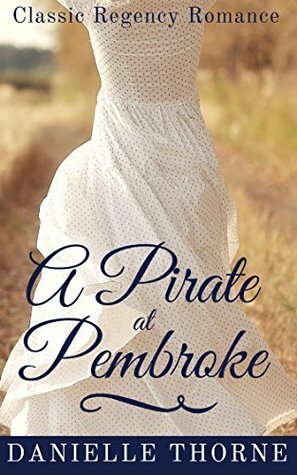 There are some twists that brought action and interest to the plot, but much of the story was slowed by mundane details (which more serious lovers of history or the Regency era might appreciate more than me). Unforgettable Love Event: Author Danielle Thorne- Freebie & Giveaway! Sophie took a nervous breath. He stood there, one step above her like a giant, her bedclothes gripped in his hand so tight it shook. She hadn’t heard him shuffle down the hall after her. He moved as silent as a ghost when he wanted — even with a cane. She found the courage to meet his penetrating gaze. Sophie swallowed down her frightened apprehension. She tried to beg his pardon, but her lungs failed her, and she coughed in reflex. She covered her mouth with her fingers. “I’m so sorry,” she repeated between them, her cheeks hot with humiliation. She stared at the fistful of her garments he’d snatched, aware his eyes examined her from her straight, waist-length hair down to her naked ankles. With a jerk, he dropped her shift like it burned his hand. Giveaway Details Ends 6/30/18 Open only to those who can legally enter, receive and use money sent via Paypal or gift codes via Amazon.com. Winning Entry will be verified prior to prize being awarded. No purchase necessary. You must be 18 or older to enter or have your parent enter for you. The winner will be chosen by rafflecopter and announced here as well as emailed and will have 48 hours to respond or a new winner will be chosen. This giveaway is in no way associated with Facebook, Twitter, Rafflecopter or any other entity unless otherwise specified. The number of eligible entries received determines the odds of winning. This giveaway was organized by Kathy from I Am A Reader and sponsored by the author. VOID WHERE PROHIBITED BY LAW.